Nestled on a beachfront enclave within the exclusive private ommunify of Talpe – Galle, Serenia offers residents serenity, luxury and authenticity that exemplify the best of Sri Lanka. Bordered by clusters of coconut trees, these spectacular homes invite residents to detach from the modern world. Attractive investment return of 8-10% USD p.a. 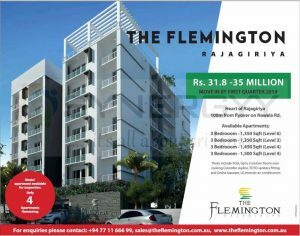 The Flemington Rajagiriya condominium apartment 500m from Colombo, in Rajagiriya, The Flemington offers 30 elegant condominiums designed by award-winning architect Darnie Rajapakse. The unique designs of The Flemington are influenced by Australian concepts that provide ample space inside with unprecedented privacy amidst big city living as in Melbourne and Sydney. Prime Lands brought you a special offer for owning a land in lush mountain range in cold Nuwara Eliya, a scenic place with paths, rich foliage, a cool and calm environment. 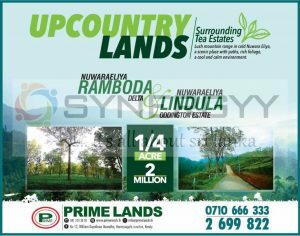 2 Prime Land Locations are available at Nuwaraeliya Ramboda Delta and Nuwaraeliya Lindula Oddington Estate. 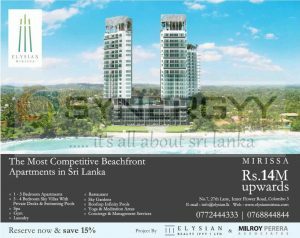 Elysian Realty (Pvt) Ltd and Milroy Perera Associates Brought you a luxuries home at Mirissa for Rs. 14 Million Upwards. 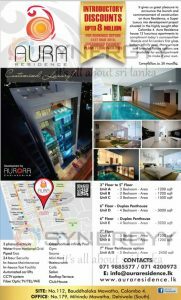 Aurora engineering commencement of construction of Aura Residence at No 112, Bauddhaloka Mawatha, Colombo 04. Just near to HSBC Bambalapitiya. 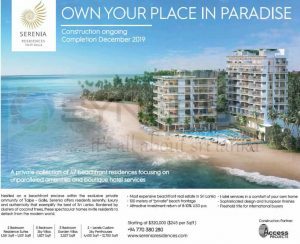 Aura Residence comes with 7 Story building with 12 luxurious apartments of 1200 to 3200 Square feet condominium houses with Glass bottom Infinity Pool for each residence. Introductory Discounts up to 8 Million for booking before 31st March 2018 and customized payment plan and loan facilities could be arrange. 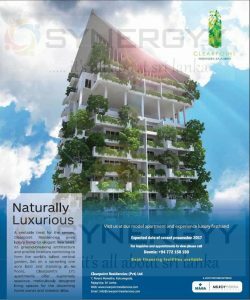 Dynasty Residence is the first multi family residence building in Sri Lanka to achieve ’US Gretn Building LEED GOLD Certification. Kumkang Kind Formwork system has accumulated a deep technical know-how throughout the years. We are heavily investing in R&D to offer the most innovative products in formwork market. 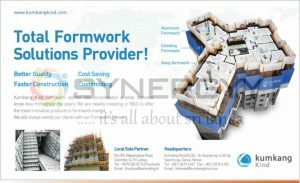 We will always satisfy our clients with our Formwork System. The luxury you deserve with the minimalism you seek. 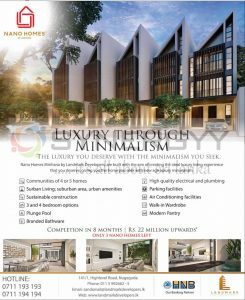 Nano Homes Mirihana by Landmark Developers; are built with the aim of creating the ideal luxury living experience that you deserve, giving you the home you seek with new age luxury minimalism. ICC and National Housing Development Authority offers Mount Clifford Range Homagama as Public –Private Partnership project. We’re turning your world inside out! Exceptionally spacious apartments with wide open balconies are yours to enjoy. 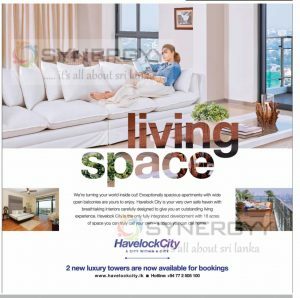 Havelock City is your very own safe haven with breathtaking interiors carefully designed to give you an outstanding living experience. Havelock City is the only fully integrated development with 18 acres of space you can truly call your own – a space you can call home. Booking are open for the new towers of Stratford Tower and Melford Tower. 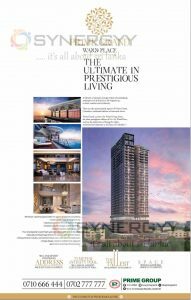 Both towers are 28 floors each and showcasing a mixture of 2, 3 and 4 bedroom apartments as well as a limited number of penthouses. 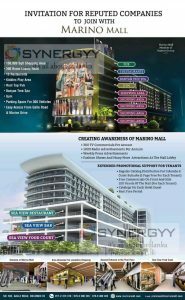 Havelock City have now launched our 3rd phase of the project and are scheduled to complete all 4 towers by 2019. We are presently accepting reservations at only 5% of the purchase price. Prices are attractive and we are presently only selling a limited amount of units at Sri Lankan Rupee prices. The state of the art club house is the largest for any development and is ready for use exclusively for the residents. There are many advantages to you in considering purchasing an apartment at Havelock City. 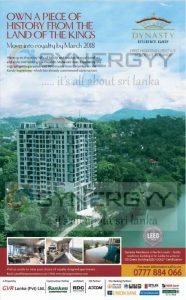 Largest ongoing Residential development project in Sri Lanka. High class residential apartments designed to meet international standards. State of the art design and the quality of the material used. Largest commercial mall with great recreational facilities. Large 7 ache garden for the residents along with children’s playground. 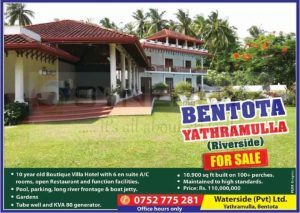 Water Side (Pvt) Ltd, Yathrmulla, Bentota announces to sell their Boutique Villa Hotel for Rs. 110 Millions. This Boutique Villa Hotel is 10 year old Hotel with10,900 Sq Ft build on 100+ Perches land with 6 en suite A/C rooms, open Restaurant and function facilities, Pool, parking, long river frontage & boat jetty, Gardens. 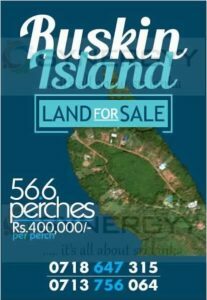 56.6 Perches Land for sale in famous Ruskin Island for Rs.400,000/- per perch. 375 Perches from Kadduwa island in Koggala Lake about sale for Rs. 350,000/- per Perch. In the heart of the Colombo city with access to super markets, Schools, Hospitals, Hotels, Important Government Institutes including Divisional Secretariat, Banks, Restaurants, Galleries and many more hot spots within few minutes makes your life easier. 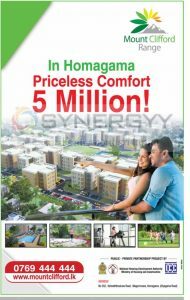 Also the prestigious address of Colombo 05 will make the value of your property a worthwhile investment for life. 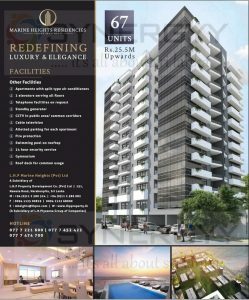 L.H.P Marine Heights (Pvt) Ltd is an subsidiary of L.H Piyasena Group of Companies brought their new luxury Appartment in Marine Drive with 67 Units, Prices starting from Rs. 25.5 Million Upwards. A veritable treat for the senses, Clearpoint Residencies gives luxury living an elegant new twist, its ground-breaking architecture and pristine interiors combining to form the world’s tallest vertical garden. Set on a sprawling one acre land and standing at 46 floors, Clearpoint’s 171 apartments offer supremely spacious, meticulously designed living spaces for the discerning home owner and investor alike. 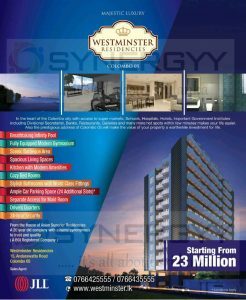 Visit us at our model apartment and experience luxury firsthand, Expected date of vacant possession 2017. Bank financing facilities available, for more details contact to Clearpoint Residencies (Pvt) Ltd , #07, Perera Mawatha, Kotuwegoda, Rajagiriya, Sri Lanka. Opal Terrace Piliyandala brought your dream 7 perches land with home in a heavenly location of Piliyandala with stunning view of a beautiful paddy field. The location is Just 2 minutes from Piliyandala Town. 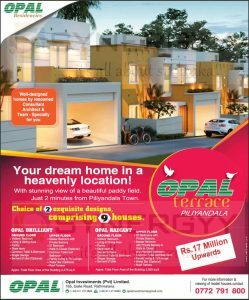 Opal Terrace Piliyandala 2 designs comprising of 9 houses in Housing plan of 2475 and 2825 sq ft floor area. A lush and peaceful life awaits you at Riverside. With 24 plots ranging from 28-50 perches in a suburban neighbourhood, this is the perfect opportunity for you to build the home of your dreams. Offering spectacular views of the majestic Kelani River that can be enjoyed from your own backyard, a lifestyle of serenity for you and your family begins here. As the new energy saving and sustainable development of Sri Lanka most of the professional are moving to electric vehicles for their day today needs. But it’s a common disappointment for those who living in apartment and condominium, which not offer any provisions for electric vechile charging unit. 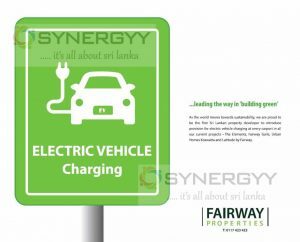 Here the New Trend introduce by fairway properties; they proud to be the first Sri Lankan property developer to introduce provision for electric vehicle charging at every carport in theirl our current projects – The Elements, Fairway Galle. Urban Homes Koswatta and Latitude by Fairway. 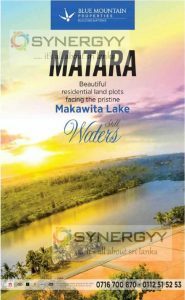 Blue Mountain brought you a special residential land plots facing to Makawita Lake front for you to enjoy the nature of Matara. Contact to Blue Mountain on 0716 700 870 / 0112 51 52 53 about the prices and other details. 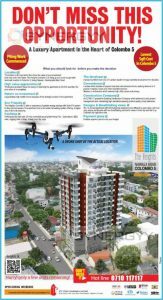 The Heights Luxury Apartment by Millennium City announces that the company offers an amazing price for their The Heights Luxury Apartment as lowest square feet cost in Colombo 05. The Heights Luxury Apartment has started their piling works and announces their clients to book their units as soon as possible before units get reserves. Apartment generates energy savings with solar PV system for the common areas of the apartment and rain water harvesting system offering higher way of life to its residents. Apartment located within minutes of popular local & International schools, Hotels, Hospitals, Banks and essential services. The 14 stories building with 64 inteligendy designed units different to each other with four very unique penthouses with 2 panoramic views. 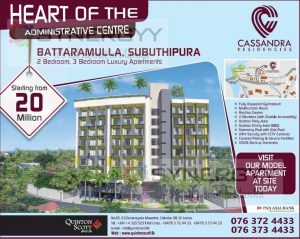 Cassandra Residencies luxury apartment coming up in heart of the administrative centre Battaramulla, Subuthipura. Apartment starting from 2 Bedroom, 3 Bedroom Luxury Apartments prices are starting from Rs. 20 Million. You could visit to the site today and see the model apartment. For more details visit to the site or Office at No.65.D.S.Senanayake Mawatha, Colombo 08. Sri Lanka. 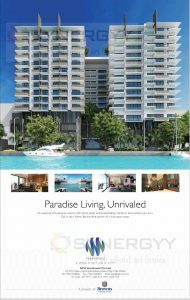 Prime Group unveiling the luxuries residency in No 65, Ward Place, Colombo 07 now. A lifestyle of ultimate prestige within a breath-taking masterpiece of architecture, all wrapped up, in sheer comfort and exclusivity. 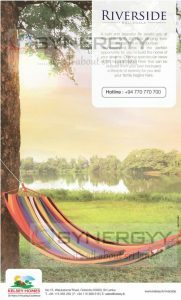 These are the quintessential aspects of Prime Grand, Colombo’s residential address of esteemed choice. 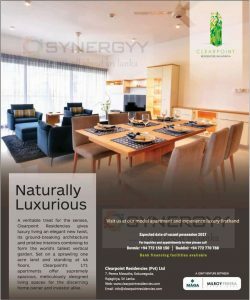 Visit us at our model apartment and experience luxury firsthand at Clearpoint Residencies (Pvt) Ltd, #7, Perera Mawatha, Kotuwegoda, Rajagiriya, Sri Lanka. 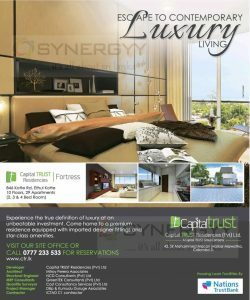 Capital Trust is a leading stock brokerage company in Sri lanka entered into condominium development, Experience the true definition of luxury at an unbeatable investment. Come home to a premium residence equipped with imported designer fittings and star-class amenities at #846, Kotte Rd, Ethul Kotte. Total of 29 Apartments (2, 3 & 4 Bed Room) in 10 Floors. Nasandhura at Magu, Male 20026. Paradise Living, Unrivaled an expanse of turquoise waters, soft white sands and breathtaking moments everywhere you turn Call it your home. Be the elite owner of a luxurous haven.